A medical exam conducted to unravel the cause of death of Festus Iyayi showed no evidence of bullets, a source familiar with the autopsy has informed SaharaReporters. 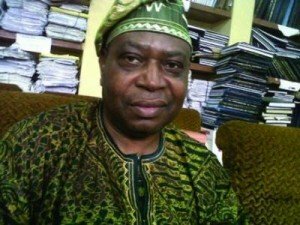 Mr. Iyayi, a professor of business management at the University of Benin who was also a well known novelist and academic activist, he died November 12 in an automobile accident near Lokoja. Mr. Iyayi was on his way to attend a meeting of the Academic Staff Union of Universities when the vehicle in which he was traveling was hit by a car in the convoy of Governor Idris Wada of Kogi State. Our source said that a team of pathologists who included experts and witnesses from ASUU, medical doctors at the University of Benin Teaching Hospital and the Nigerian government carried out an autopsy and unanimously determined that Mr. Iyayi was not shot. With the official report of the autopsy still being put together, our source disclosed that the participants in the autopsy confirmed the presence of holes in Mr. Iyayi’s body, even though they could not trace the piercings to any bullets. He added that medical examiners recovered no pellets from the late Professor’s body. The autopsy was reportedly done about a week before the commencement of Mr. Iyayi’s funeral. The late academic’s funeral ended yesterday with a “thanksgiving Mass at Saint Mathew’s Catholic Church in Ugbegun, Edo State. Mr. Iyayi’s remains were buried in the same town on Saturday. A renowned Nigerian writer and activist, Mr. Iyayi was a former national leader of ASUU. He also served as a former President of the Committee for the Defense of Human Rights (CDHR). SaharaReporters disclosed that Mr. Iyayi was killed in a crash involving the notoriously reckless convoy of Kogi State Governor, Mr. Wada. Mr. Iyayi was on his way to Kano to attend a council meeting of ASUU executives to discuss the next step in a long-running strike by lecturers that has grounded Nigeria’s public universities and mired the country’s education in a crisis. However, members of the late Professor Iyayi’s family and activists close to him said they have not been informed of the final results of the autopsy. His son, Omole, told Saharareporters earlier today that the family had not received any official autopsy reports from doctors in Benin. He said they were therefore surprised at the conclusions.